Kalanchoe species show up in garden centers, florists, even at the grocery store. The reason? They're bright and colourful, or weird and bizarre, and always appealing. Many are handed down as Legacy Plants, from generation to generation. Several have reproductive leaves, with their babies ringing the edges in a characteristic trait. 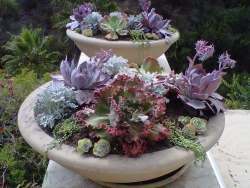 They are easy to grow, and will put up with mishandling, over or under watering, being left outside when a windstorm comes up, or otherwise neglected and abused. Kalanchoe species are some of the most widely used houseplants, for good reason. Please keep in mind that they are also poisonous, and for this reason it's important to keep them away from pets and small children. Kalanchoe daigremontiana: Mother of Thousands (or Mother of Millions, depending on how many babies she has) with spotted but spear shaped leaves outlined with baby plants. Kalanchoe 'Butterfly Wings' is a beautiful red to purple clone of Kalanchoe daigremontiana. Kalanchoe delagoensis: tubular odd looking foliage, spotted in shades of grey and olive green with baby plants on the edges. Also known as Kalanchoe tubiflora, and called by the common name of Chandelier Plant, or Mexican Hat plant after the way the little plants dangle off the edges. 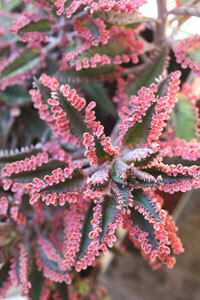 Kalanchoe thyrsiflora: the Flapjack Plant, with large flat stacks of roundish leaves. 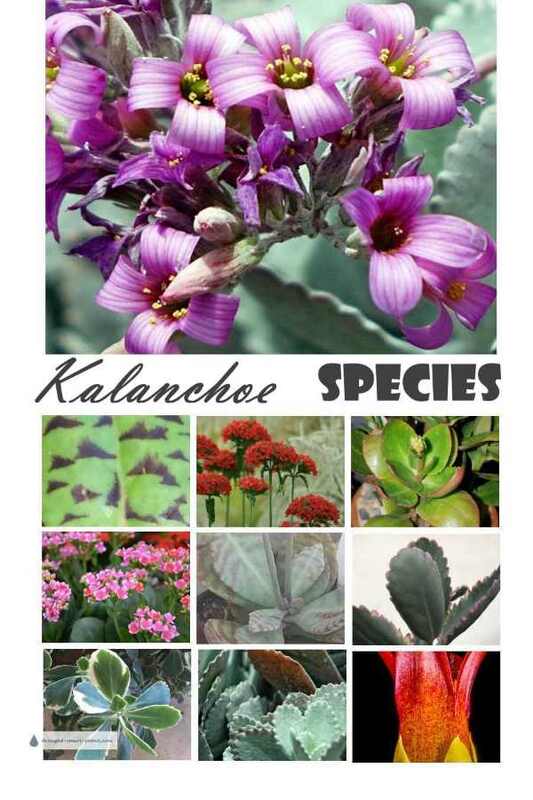 There are also named varieties of some of these species, which are bigger, better, even more colourful or have some other benefit over the actual Kalanchoe species. Some that you'll be sure to find are Kalanchoe blossfeldiana hybrids, also known as Flaming Katy, which have gorgeous blooms in all shades of pink, orange, red and white. There are many other species of this widely grown genus. Some look completely different and you would swear that they couldn't possibly be related. Explore more of these amazing plants, you'll be sure to find at least one that appeals to you. Need help identifying this succulent. Slightly variegated leaf, red stems. See photo. Could you please tell me what type of Kalanchoe this is. Thank you! I can't seem to find out what family this succulent belongs to — it seems very unique. Can you tell me what it is? Thanks! Help! I think I'm killing it! Small Tree-Like Succulent, Please help identify! Is this a Kalanchoe Crassula Rogersii? What is this plant with a unique flower? Help Me Id My Beauty! Tall fuzzy light green succulent plant.